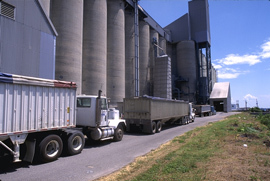 Trucks line up for inspection and unloading at a grain elevator near Charleston, SC. Over the last 50 years, as farm production has become more efficient, the number of smaller farms has decreased while the number of large-sized farms has grown. In many cases, large corporations buy out smaller farms that cannot compete with larger farm operations. The largest number of farms is found in the south and north central regions. The largest-sized farms are found in the north central and western United States. Flat, fertile land in these areas makes large-scale mechanized farming possible. Click on MAPS below for additional information about corporate farming.